An unwritten rule in table tennis says that 50% of the wining point is the execution of a good serve. In spite of the strict laws which limit the effectiveness, the serves provide great advantage in the modern table tennis. Serve is considered as one of the most important part of the daily practice. Many top players spent a lot of hours developing new serves. Three times per week for 1-2 hours each is a standard for top class players. Each player (basic and medium stage) has to learn at least 6-7 different serves and use them alternatively during the match according to the pre-determined tactic. The grip. Grip flexibility is important for the wrist movement. The distance of the player from the table during the serve. The ball throwing. Different speed is gained from a high toss serve in comparison with the low toss serve. The angle of the racket during the impact. Different angle gives little or more spin. The speed of the arm and the wrist movements at the impact phase which affects the speed of the ball. The compination between arm, wrist, feet and waist movements at the impact phase. The location where the ball bounce at the server's court affects the bounce on the receiver's court. The concentration of the player. The type of rubber and the racket. 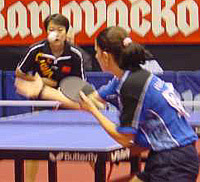 The serves have to send to the weaker side of the opponent in order to make an effective "third ball attack". The server has to change his serves constantly. This is good if we want to confuse the opponent. It gives us also the opportunity to find the "effective serve" which will make the point for us. Special and tricky serves are for the crucial moments of the match. In order to get the most of your serve, you have to train hard. The more hours you spent for your serves the more points you will get from them. If you had learned a bit of recent tennis techniques, you know that when you serve, you "play the ball". In table tennis, we play the ball by hitting it where you want. Learn how to hit the ball. Most important 1. Use different parts of the racket to achieve different objectives when playing a serve(i.e. the top of the racket is faster, spinnier than the center or bottom. Consider that when playing a serve, two look-a-like serves can achieve different results for your game plan) 2. Watch Karakasevic!